Fast forward a year and I’ve started to experience intense itching upon entering my kitchen. 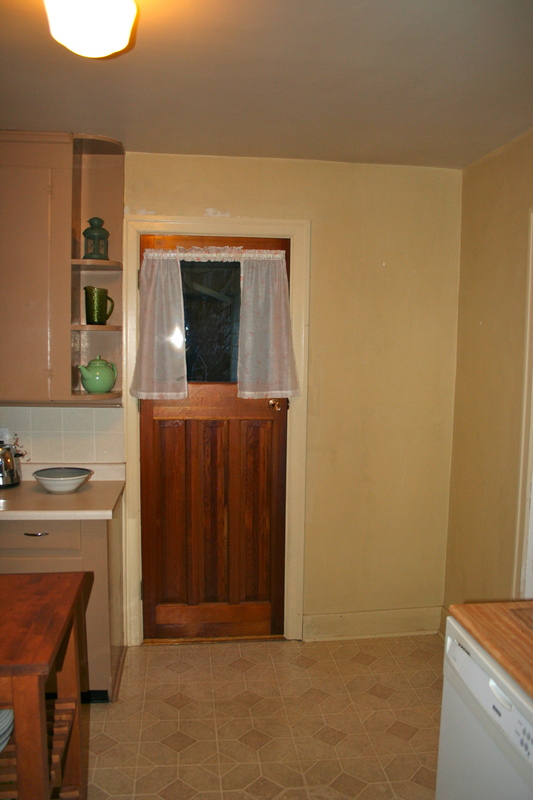 I’d look at the handyman special of a cabinet beside my awkwardly placed stove and feel my face twitch. 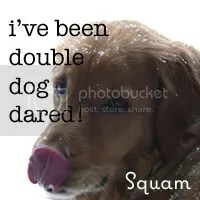 I swallowed hard when I had to reach for my dinner plates, stored not in the upper cabinets (because they are too narrow to fit plates), but in the lower, afore-mentioned handy man special of a cabinet. My eyes would protest when they looked upon the brown wallpaper with orange flowers and the brown “dead leaf” pattern on my ceramic backsplash…tension was building. It seems everyone around me has recently renovated their kitchen or they have plans to. I have found myself dreaming of a complete gut job after letting my hands spend too much time fondling someone else’s brand new faucet, or offering to cut up the vegetables just to find an excuse to get closer to the rustic yet modern butcher block counter top, or complaining of thirst so that I could procure myself a glass of water at the elegantly appointed apron front sink…must resist! “This backsplash is perfectly functional” I’d tell myself. 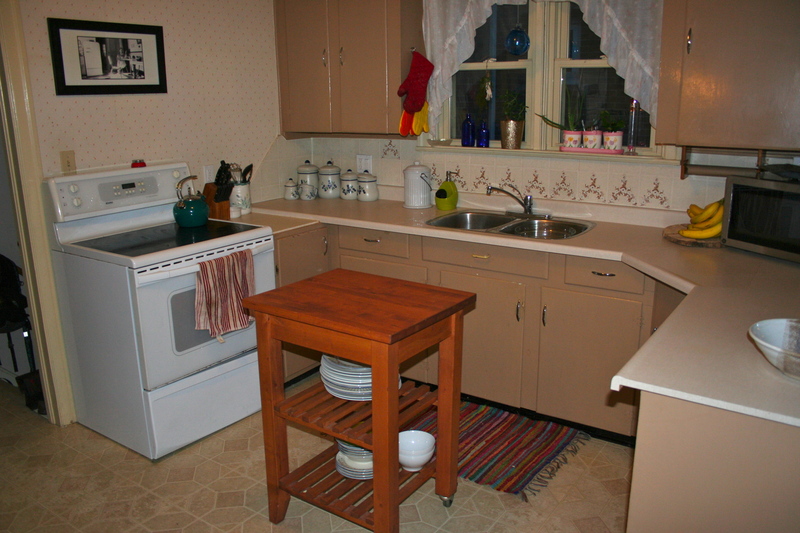 “These cupboards have been here since this house was built. You don’t get that kind of quality anymore” I’d say. “No one has noticed that you hung your pictures up on the random nails and hooks that were already in the wall” I’d lie. Blarghhhhh!!!!!!!! The truth is I kind of like my kitchen. I want to give it a new life without buying more stuff or sending perfectly good cupboards to the landfill. I like the idea of putting my money towards other things my family would enjoy. There are bigger problems in this world than an outdated kitchen. But I don’t want to be ridiculous either. There is work to be done. And I have some ideas. If you want to hear about them keep reading. If you think you might have some awkward space solutions, take a look at my photos and suggest away! The placement of appliances is the hardest bit and solutions might be possible but will likely have to wait for a more serious reno with more cash behind it, but I’m open to and welcome all input. We’ll start the tour with the view from the doorway to the dining room. 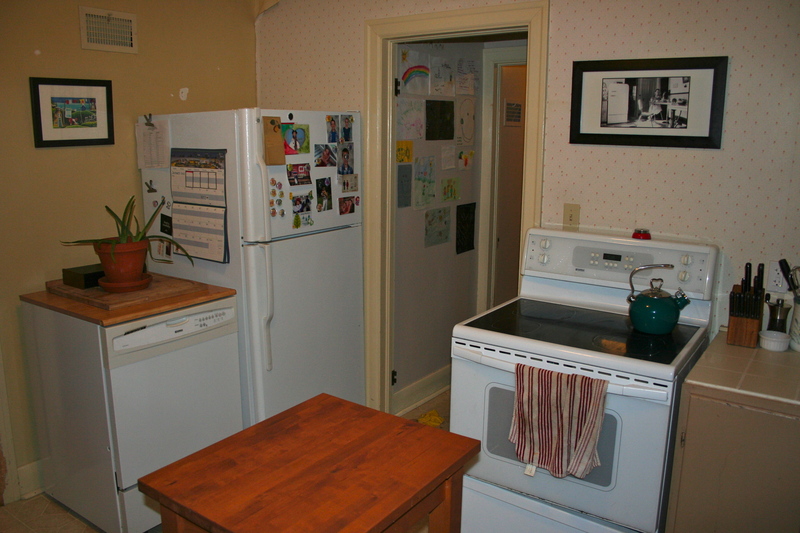 Here you will notice the previously mentioned “awkwardly placed stove” ($200 on kijiji BTW). It has been “joined” to the rest of the cabinets by a homemade cupboard with a tiled top. This cabinet is in front of the real face of the original cabinets. When you get real close you can see the drawer and the cabinet door that it is in front of – not exactly a seamless placement. This is now to be known as “conundrum #1”. If I remove it the original cabinets will look the way they were intended to look, but then there would be a stove in front of them…still awkwardly placed. 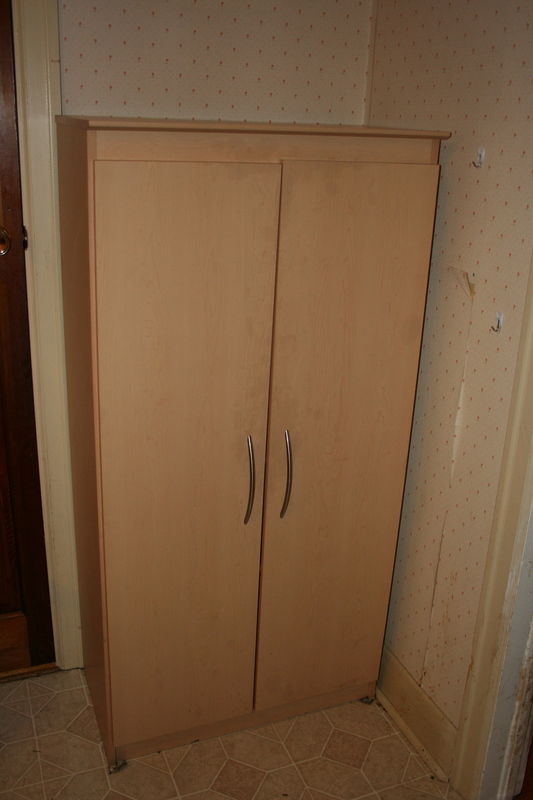 It can’t be worse than having this cabinet there though can it? What else can we see? Hmmmm, the terrible state of the flooring (conundrum #2). Its okay I’m aware. It is tired and worn and oozing nothing close to vintage cool. There is the wallpaper I mentioned and the backsplash (#3 and #4). I’ve kept quiet up until now about the hideous colour of my cupboards but, well, there it is (#5). Following along, we can now reveal the ill placed pictures that I hung on the already existing wall nails. The fridge was not located here when we moved in, it was beside the door to the backyard all by itself (see next photo). It is better here but it does look like a happy gathering of all appliances in one cramped corner don’t you think? 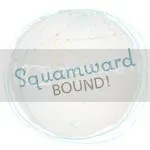 The dishwasher is the rolling, hook it up to the sink kind (which we are forever grateful for Karen and Jason!!!!). I’d love a built-in, but where to put it? Also, in the future an above the fridge cabinet would be nice…yes? no? I need your thoughts. You can understand now can’t you. Who could resist pulling down the wallpaper with those seams and edges pleading to be pulled!! The rubbermaid pantry is already gone. Thanks Kijiji! Getting rid of it meant making the other cupboards really work. After we reorganized things a bit we realized that we probably never needed this pantry to begin with and when you have more space you just end up with more stuff. 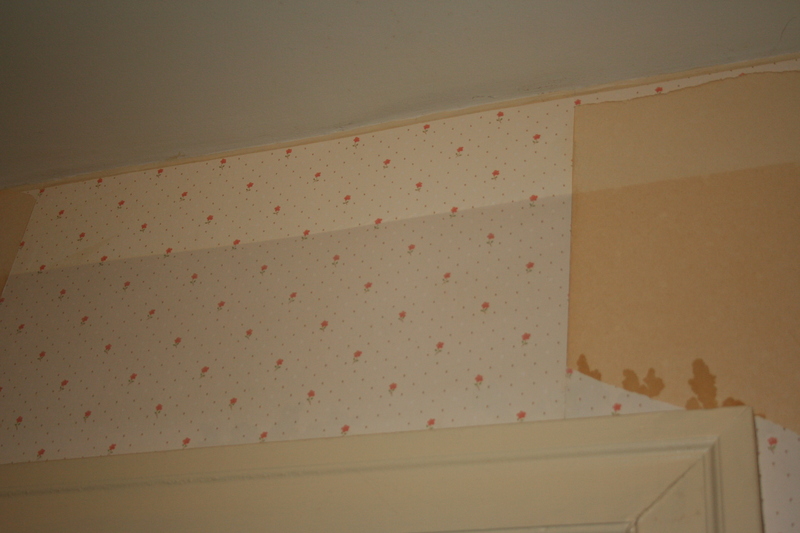 And here is a good look at the hideousness that was the wallpaper. Wanna know what is worse? This. Look. At. How. Dirty. Just look at it. Oh dear. Why didn’t I take this down when I moved in again? 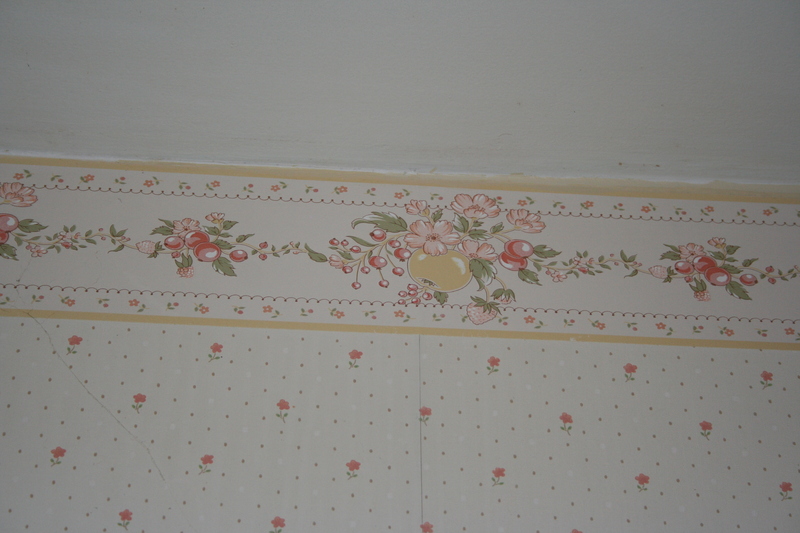 Right, I had been scarred by wallpaper removal in the old place. Turns out this stuff had been on so long there really wasn’t anything holding it on anymore so removal (with water and vinegar) was a breeze. And an equally unappealing mushroom colour paint job was revealed. Fun thing is the paint under that paint is probably the colour I’ll paint the walls…I know right? Wait long enough and anything will come back into fashion. So there is it. Hit me with your suggestions. I already have an idea of where I am going with this but all help is welcome. Taking down the wallpaper was kind of nice actually. I kept thinking of Flora, the woman who lived in this house since it was built and raised her family here…she likely pick the wallpaper and had someone make the handyman cabinet to solve the problem of the awkward stove issue. Under the wall paper I found other nail holes that made me wonder how this room might have been arranged before…might a calendar have hung in that spot? Was there a breakfast table here? Kitchens are the heart of the home after all. We spend enough time here and I can’t wait to give it new life and make it our own. I’ll add updates here as we go!